Below is a basic hourglass chart created from the TMG SAMPLE project. It is an example of a chart with generational labels added to allow a reader to easily determine relationships on the chart. 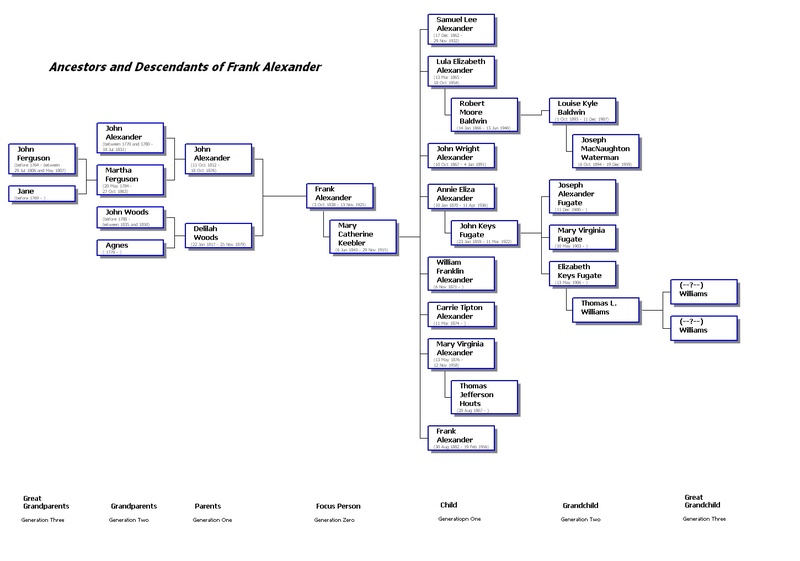 This chart is limited to three ancestral generations and three descendant generations for illustration purposes. This limitation does not illustrate well the value of the labels which would be more easily seen with more generations. But the idea works for any number of ancestral or descendant generations. The chart is created normally, and then the canvas size is increased about two inches (more or less to personal preference) to allow for the lines at the bottom. The lines at the bottom are basically a series of transparent boxes with four blank lines. Line two has the name of the generation in line above the box. Line four is the generation count from the Focus Person who is Generation Zero. Thus Parents and Children (of the Focus Person) are Generation One.